I still recall my days of filling out the Free Application for Federal Student Aid (FAFSA) and applying for student aid. My heart sunk when I saw that the estimated cost of attendance would be around $40,000 per year or a total estimated debt of $160,000. There was also a bit of an uneasy feeling when the school financial councilor at orientation was there telling us not to worry and that this level of debt was common for graduating medical students. Turns out this number is not far off. According to the AAMC the average debt of a graduating resident in 2015 is $180,000. If you plan on having below this amount or currently have less than this is loans then congratulations! If you’re above it then remember that this number is an average and there are people with debt above this number. Texas is known for relatively less expensive medical school compared to other areas of the country. 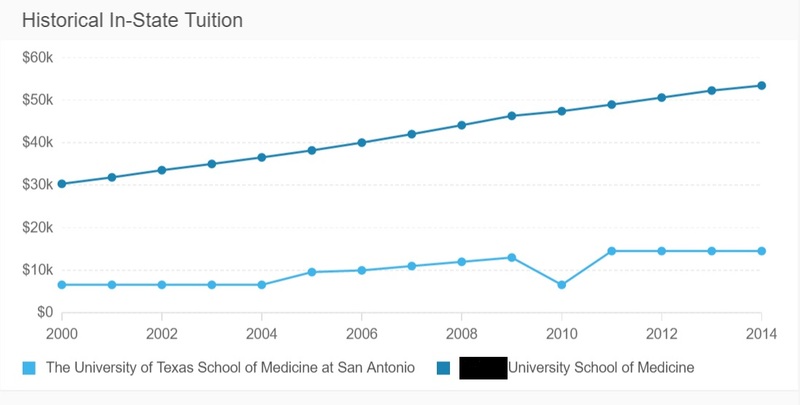 I looked back at my numbers and spent about $12,000 per year for tuition alone to attend medical school in San Antonio, Texas. At my last check of their website, tuition has now increased to $18,000 per year which is a year over year increase of over 5.9%! I’m glad I graduated when I did as the cost for medical education seems to have no signs of slowing. For what its worth, I’m sure doctors for the past 20 years have been telling themselves this. If you are considering applying to medical school and money is a factor then consider cost of your education when you consider which school to attend. Out of state tuition for Tufts for example is on the order of $80,000 a year! My favorite website to get a ballpark idea on cost of education is StartClass. Here you can look up stats for medical schools including how many interviews they give vs applications received all the way to cost of attendance. The difference in the tuition cost of attending these two medical schools is approximately $130,000! Definitely nothing to laugh at and if one is fortunate to be accepted to multiple locations this should be considered when picking which school to attend. The difference between the 2 most extreme examples is $166,752 over a four year period! 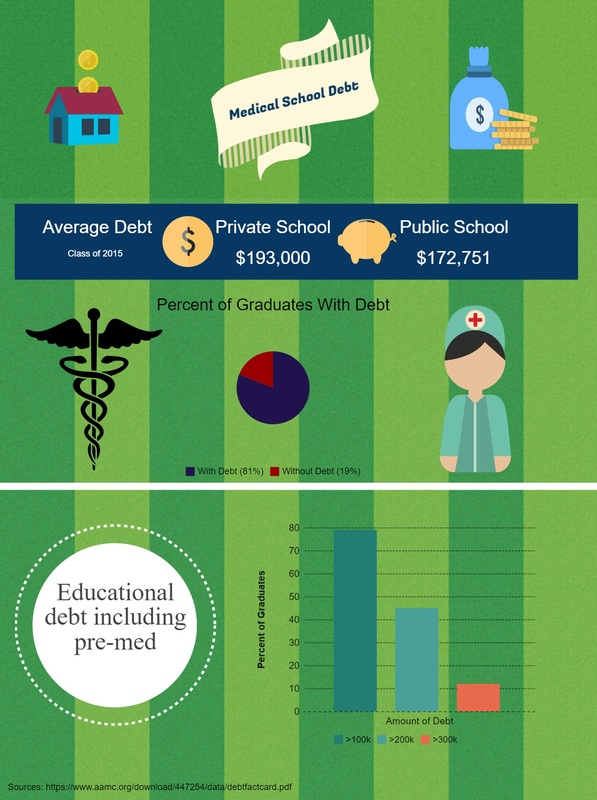 I have made an Infographic to help relay what the average debt of a graduating medical resident was in 2015. The average debt continues to increase yearly and are up 2% overall from 2014. My first Infographic that I have ever personally made 🙂 Hope you like it. Deciding which school to attend is a very personal decision with many factors that are unique to each individual. It is a privilege to be accepted into the profession, however, at the same time I believe its important for new or upcoming doctors to be aware of the financial burden they will be taking on. I support taking on debt to obtain a MD as income for the near future will be high enough to pay off the debt. For some, debt > $300,000 a year can quickly balloon to much higher levels and needs to be considered if paying off debt during residency is not an option for you. Now that you know what the average debt is where do you or did you measure up? It’s unfortunate that some DO programs charge much more than similar MD programs. Luckily, the debt on a MD or DO salary can be paid off if attacked aggressively. I think most people with debt would agree that the mental weight off 6 figures of debt for more than half a decade really has a negative effect on mental health. Some of my colleagues who are over half a million in debt describe a feeling of hopelessness. However, once the attending paychecks roll in, the debt is manageable. Thanks for reading! 400K for me (undergrad + medical school + years of compounding at 6.8%). Glad that’s out of the way! Congrats Live Free MD! Did you do anything to celebrate after paying off that amount of debt? To be honest, I was ecstatic for about 5 minutes, and then extremely humbled by the fact that I was 35 years old with essentially $0 to my name. A career in medicine is an exercise in delayed gratification, especially financial gratification!